OFFICE 52 Architecture is a studio design practice that envisions transformative projects with the integration of architecture, innovative technology and artistic expression for creative solutions. We express ideas not just in compelling large-scale building projects such as the new competition-winning Nano-Bio-Energy Technologies Building at Carnegie Mellon University and the innovative Tykeson Hall for the College of Arts and Sciences at the University of Oregon but also in smaller more playful projects like a museum installation that draws inspiration from saturated color and the poetics of natural light. Our versatility in a variety of traditional and innovative materials and fabrication techniques as a medium for exploring spatial ideas provides opportunity for us to create inventive and cost-effective building solutions with architectural presence and rich spatial experiences. Architecture, art and construction/fabrication technology are never entirely separate and the boundaries between them are quite fluid. In the studio we work in digital and traditional media and embrace the physical study model, alongside 3D visualization, as an effective and efficient means to test ideas during the design process. We research material fabrication technology methods or create new innovative ones while conceptualizing our design ideas. We develop an overall vision and conceptual idea at the beginning of each project while simultaneously thinking about fabrication and articulation of details. Profound attention to climate change, sustainable technology and how we use our resources, use of natural daylight and the connection between people, place and the surrounding landscape is important for each design in regard to the reality of each location. For us architecture is about looking and seeing and listening and thinking and sketching and building and intuitively experiencing the space. It’s about how forms and planes interact with natural light in the pastoral or urban landscape. It’s about the transformative power of materials and how to juxtapose and use them in new ways for a unique design with poetic simplicity and an economy of means. It’s about the idea, and what design and architecture can be. The studio has won numerous design awards, participated in invited speaking engagements, and has been published in local, national and international publications. The most recent book released about our creative process is entitled, Form and Dichroic Light. As a licensed architect and accomplished artist, Michelle LaFoe has forged a path in both architecture and art with project-based and series-based work with award-winning higher education, museum, and art/architectural installation projects. Isaac Campbell has planned, programmed and designed creative and highly sustainable environments and buildings for universities and educational institutions, museums, cultural institutions, and commercial and private clients worldwide. 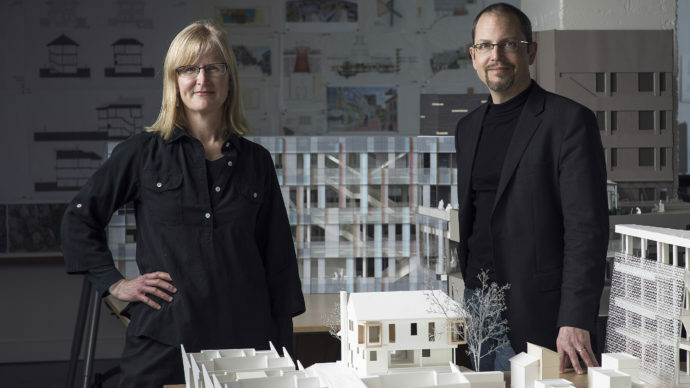 Michelle LaFoe and Isaac Campbell are the founders of OFFICE 52 Architecture. Founding principal of OFFICE 52 Architecture. Professional accolades include a Fulbright-Hayes Scholarship to Italy and a grant from the Graham Foundation for Advanced Studies in the Fine Arts. She has taught in Rome and Perugia, Italy, lectured at and chaired conferences at the American Academy in Rome and the College Art Association, and has exhibited internationally. Michelle earned a Bachelor of Architecture and a Bachelor of Arts at Rice University and a Post-Baccalaureate Graduate degree in Drawing and Painting from the School of the Art Institute in Chicago. Although accepted for graduate work at M.I.T. and Yale, Michelle chose to become a Distinguished University Research Fellow at the University of Illinois in Champaign-Urbana and completed her Master of Architecture degree in the History and Theory of Architecture while in a Ph. D. program, working with Dr. Richard Betts. Afterwards she completed a year of independent, scholarship funded post-graduate research at Yale University in design and fabrication technology. In addition to founding OFFICE 52 Architecture, Michelle has practiced with Centerbrook Architects and with AIA Gold Medal winner Cesar Pelli, FAIA, at Cesar Pelli & Associates (now Pelli Clarke Pelli Architects), where she was a designer on projects such as the National Museum of Art and its above-grade sculptural stainless steel entry pavilion in Osaka, Japan. Michelle has experience working on cultural, museum, university/educational, commercial, residential, and architectural installation projects. Founding principal of OFFICE 52 Architecture. Isaac began his career in the design studio of AIA Gold Medal winner Cesar Pelli, FAIA, where he quickly became a Design Team Leader for major projects including the Chubu Teiju Museum and Cultural Center in Kurayoshi, Japan, the New York Times Headquarters Competition in New York City, and the Art/Architectural Enhancement Program for the Washington D.C. National Airport where he worked with internationally acclaimed artists such as Al Held and Nancy Graves on installation design, fabrication and coordination of studio work into the architecture. For the last 20 years, much of Isaac’s work has focused on creating transformational yet cost-effective designs and buildings for cultural, commercial and educational institutions. These include the award-winning Scott Hall the new Nano-Bio-Energy Technologies Building for the College of Engineering and the Wilton E. Scott Institute of Energy Innovation at Carnegie Mellon University, the innovative Tykeson Hall for the College of Arts and Sciences at the University of Oregon, and Stanford University’s award-winning Science and Engineering Quad and Buildings, as well as numerous design competitions. Isaac received his Bachelor of Arts and Bachelor of Architecture from Rice University after study at the School of Liberal Arts at Alfred University in New York. He has lectured has been a guest critic at architecture and design programs across the country and abroad. OFFICE 52 Architecture is a certified Emerging Small Business (ESB). Top photo portrait by Christian Colombres.